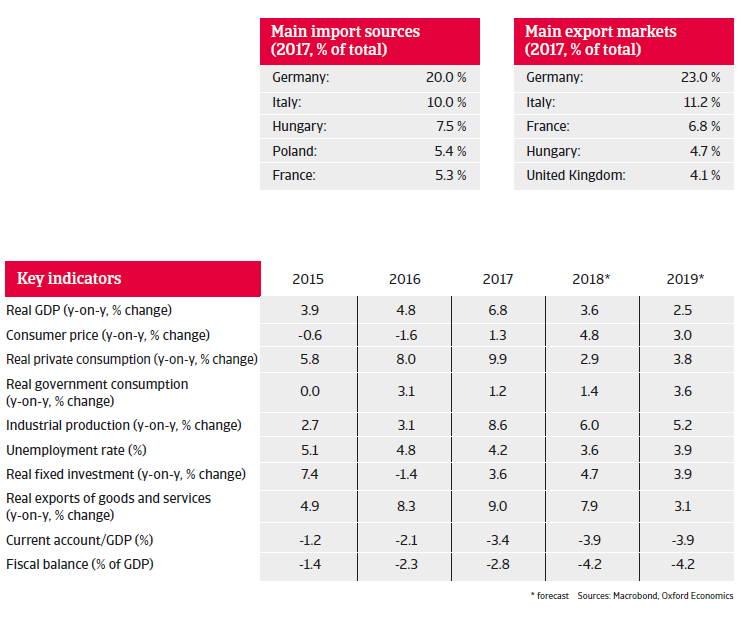 Romania´s GDP is expected to grow at a lower pace in 2018 and 2019 as export growth has slowed and domestic demand is cooling due to higher interest rates. Corruption and graft remain major issues in Romanian politics and economics, and popular dissatisfaction and distrust with the political system run deep. There are regular mass demonstrations against the policies of the ruling coalition government between the social democratic PSD and the liberal ALDE party. In June 2018 Liviu Dragnea, the powerful party leader of the PSD, was convicted for abuse of power, sentenced to more than three years of prison in the first instance. The government has repeatedly attempted to pass decrees that would decriminalise certain categories of abuse of power and corruption cases and to bring the judiciary under political control (In summer 2018 the head of the National Anticorruption Directorate DNA was dismissed on flimsy grounds at the behest of the government). While president Iohannis tries to act as a counterweight against the government within the boundaries of his constitutional powers, the government has threatened to initiate impeachment proceedings against him. Romania has shown robust GDP growth rates over the last couple of years, mainly driven by surging domestic demand. In 2017 economic growth increased almost 7%, mainly due to robust 10% growth in private consumption, helped by low interest rates, rising wages and decreasing unemployment. 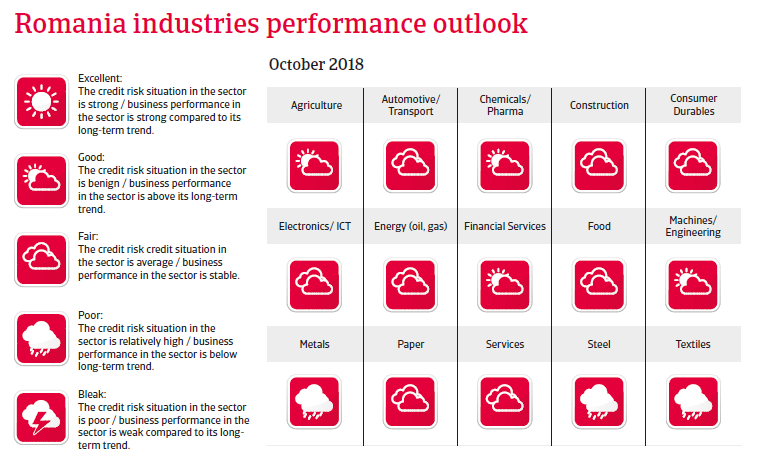 GDP is expected to grow at a lower pace in 2018 and 2019, as domestic demand is cooling down. 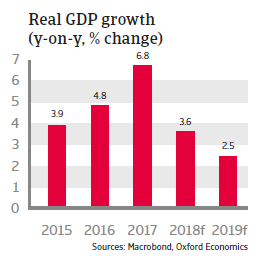 This slowdown is also due to interest rate increases since early 2018 in order to combat rising inflation and to slower export growth, as demand from the Eurozone has weakened. The budget deficit increased in 2016 and 2017 due to a VAT reduction and the expansion of public spending in the run-up to the November 2016 general election. 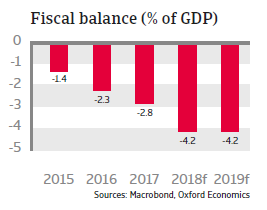 In 2018 and in 2019 the deficit is expected to increase further due to the continuation of expansive fiscal policies. This leaves the government budget more dependent on a positive economic outlook, and there is still an urgent need for improving tax administration. However, at about 38% of GDP public debt remains moderate. Romania remains exposed to some major vulnerabilities. Red tape and corruption still hamper the economic development. The current account deficit has increased again above 3% of GDP in 2017 and is expected to increase further in 2018 and 2019 due to elevated import demand. At the same time the currency is subject to some volatility, and the country remains vulnerable to capital outflows should there be adverse internal (e.g. a major political unrest) and/or external developments. However, at the same time there are some solid buffers in place – abundant international reserves (more than five months of import cover), low public debt and a flexible exchange rate.